“The Beetle is the very first Volkswagen car people remember about; with its unique shape and reliability, it wrote motoring history. People’s fascination for this lovable bug shaped car has made the Beetle one of the world’s most popular cars across decades and Volkswagen is proud to bring its legend into India,” he said. 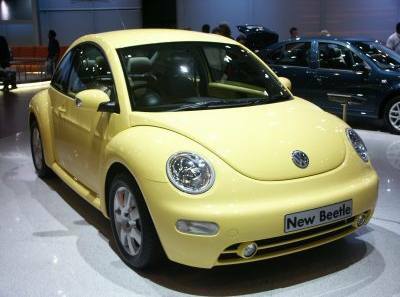 The New Beetle is a marvel design of German engineering based on the level of successful series. The New Beetle is equipped with a 2.0 litre 4 cylinder petrol engine with an output of 115HP at 5400 rpm. It is paired with a 6-speed automatic transmission. Advanced occupant safety is one of the key features of the New Beetle which comes equipped with 4 Airbags, Anti-Lock Braking System (ABS), Electronic Stabilization Programme (ESP) and engine immobilizers. It is equipped with a 6 CD changer, power steering for better drivability, body coloured exterior mirror housings, tailgate handle and heat insulating tinted glass. The large 15” alloy wheels, ensconced in their flared arches, give it a higher and more commanding stance. The lights, refined lines, fresh color palette and new fabric seat covers are few details that are additions to the new Beetle. The front centre armrests and the dashboard are proof of the sure instinct of high design quality which interprets the classic elements of the New Beetle in a contemporary way. The round stern, dome shaped roof, rear section, the fenders with the hint of a footboard, the embedded round head and tail lights – bring back memories of the Beetle while the sharp accented lines and windows confirm the up-to-date design and express youthful energy.